© 2014 by Linda Nagata. The battleground was an ancient desert city. Beginning at sunset, firefights had flared up all across its tangled neighborhoods and Valdez was right that her squad needed to advance—but not so fast that they ran into a trap. Karin’s worksite was an elevated chair within a little room inside a secure building. She faced a curved monitor a meter-and-a-half high, set an easy reach away. Windows checkered its screen, grouped by color-codes representing different clients. The windows could slide, change sequence, and overlap, but they could never completely hide one another; the system wouldn’t allow it. This was Karin’s interface to the war. Presently centered onscreen were two gold-rimmed windows, each displaying a video feed captured by an aerial seeker: palm-sized drones equipped with camera eyes, audio pickups, and chemical sensors. The seekers flew ahead of Valdez and her urban infantry squad, one at eye level and the other at an elevation of six meters, scouting a route between brick-and-stucco tenements. They flew too slowly for Valdez. The lieutenant was out of sight of the seekers’ camera eyes, but Karin could hear the soft patter of her boot plates as she advanced at a hurried trot, and the tread of the rest of the squad trailing behind her. Echoing off the buildings, there came the pepper of distant rifle fire and a heavier caliber weapon answering. Onscreen, positioned above the two video feeds, was a third window that held the squad map—a display actively tracking the position and status of each soldier. Outfitted in bulletproof vests and rigged in the titanium struts of light-infantry exoskeletons—“armor and bones”—the squad advanced through the alley at a mandated ten-meter interval, a regulation that reduced the odds of multiple casualties if they encountered an IED or a grenade. Only Lieutenant Valdez failed to maintain the proper distance, crowding within two meters of the seekers in her rush to answer the call for backup. Any faster, and the little drones could miss something critical. Local time was past midnight and no lights shone in the alley, but in nightvision the walls of the buildings and the trash-strewn brick pavement gleamed in crisp, green detail. Karin wasn’t the only one monitoring the seekers’ feeds; a battle AI watched them too. It generated an ongoing report, displayed alongside the windows. She glanced at it and saw an alert for trace scents of explosives—but with a battle in progress that didn’t mean anything. Otherwise the report was good: no suspicious heat signatures or whispering voices or inexplicable motion within the apartments. “Searching.” It was a good bet someone was monitoring the tripwire. 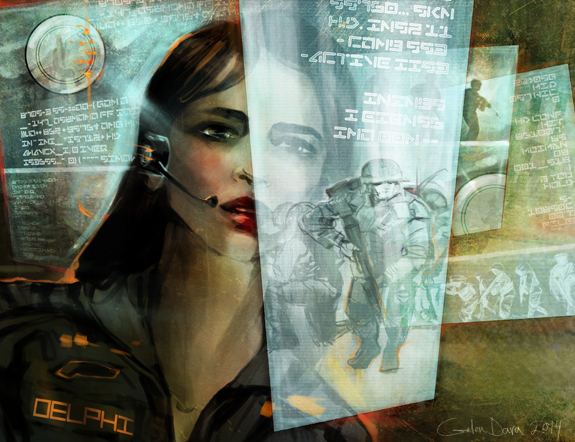 A set of windows bordered in blue glided to the center of Karin’s screen: Lieutenant Deng’s color code. The insurgent offensive had erupted all along the northern border, striking hard at Deng’s rural district. At approximately 2200 she’d been lured into an ambush. The resulting firefight had left one of her soldiers seriously wounded. A glance at the squad map showed that Valdez had retreated a few meters from the tripwire. One specialist remained with her, while the rest of the squad had dropped back under the supervision of a sergeant. Karin sent a seeker buzzing toward the figure on the rooftop and then she switched her focus back to Deng’s blue-coded windows, fanning them open so she could see the one that tracked the status of the medevac helicopter. The offensive was unprecedented and air support was in high demand. Deng’s wounded soldier was third on the list for pickup. “Deng, ETA on the medevac is forty-plus minutes,” Karin warned; that was assuming the helicopter stayed in the air. She slid the blue windows away again, switching back to Valdez. It was a kid. The battle AI estimated a male, fourteen years old. It didn’t matter. The boy was targeting Valdez and that made him the enemy. The lieutenant dropped to a crouch. The specialist was already hunkered down behind her. He aimed over her shoulder and shot—but too late. The kid had opened a roof-access door, retreating inside the building. Karin checked Valdez’s biometrics: high stress, but no indication that the slug had penetrated. Her armor had protected her. While Valdez reorganized, Karin switched to her third client, Lieutenant Holder. The set of windows monitoring his squad was coded orange. Holder was assigned to a district just outside the city. Tonight his squad waited in ambush for a suspected small-arms shipment coming in from the west. She checked his status: nominal. Checked the squad: noted all seven soldiers in position on either side of an asphalt road. Checked the wide-field view from the infrared camera on the squad’s surveillance drone and noted the suspect truck, still at almost five kilometers away. Karin sighed, took a sip of chilled water from a bottle stashed in a pouch at the side of her chair, and for just a moment she squeezed her dry eyes shut. She’d already been six hours on-shift, with only one ten-minute break and that was two hours ago. There would be hours more before she could rest. Most shifts went on until her clients were out of harm’s way—that’s just how it was, how it needed to be. She’d learned that early. Karin had trained as a handler for the usual reason: money. She’d needed to pay off a student loan. Two years so far, with a fat savings account to show for it. The money was good, no argument, but the lifestyle? Some handlers joked that the job was like a video game—one so intense it left you shaking and exhausted at the end of every shift—but for her it had never been a game. The lives she handled were real. Slip up, and she could put a soldier in the grave. That was her nightmare. She’d had soldiers grievously wounded, but so far none had died on her shift. Lately, she’d started thinking that maybe she should quit before it happened. On a night like tonight, that thought was close to the surface. Karin’s hands shook. Sarno worked a chair just a few doors down from her. He was new, and new handlers sometimes got overwhelmed, but panic was always the wrong response. At the end of the shift, every handler got to go home, smoke a joint, collapse in a bed with soft sheets, get laid if they wanted to. Their clients didn’t have that option. Sarno needed to remember that. Sarno needed to remember that however rough it got in the control room, no one was trying to end his life. Right now the supervisor would be assisting him, coaching him, getting him back on track. Karin refocused, striving to put the incident out of her mind. Dragging the gold-rimmed windows to center, she checked on Valdez, confirming the lieutenant had safely exited the alley. There were no alerts from the battle AI, so Karin switched to Deng’s window-set. Rigged in armor and bones, the squad had formed a perimeter to protect their wounded soldier. Around them, dry grass rustled beneath spindly trees, and the stars glowed green in nightvision. Karin switched to Holder. He was still hunkered down with his squad alongside the road. An infrared feed from Holder’s surveillance drone showed the target vehicle only a klick-and-a-half away, approaching fast without headlights. Just as Karin brought her attention back to Valdez, the shift supervisor spoke. Sarno walked? Karin lost track of her windows as she tried to make sense of it. How could he walk out? What they did here was not a video game. There was no pause button on this war. Every handler was responsible for the lives of real people. Her throat aching, she took another sip of water, a three-second interval when her mind could rove . . . this time back to the kickboxing session that started her day, every day: a fierce routine that involved every muscle—strike, strike, strike—defiantly physical, because a handler had to be in top form to do this kind of work, and Karin hated to make mistakes. As she looked up again, a glowing green dot expanded into a new set of windows, with the client’s bio floating to the top. Shelley, James. A lieutenant with a stellar field rating. Good, Karin thought. Less work for me. As she fanned the windows, the live feed opened with the triple concussion of three grenades going off one after another. She bit down on her lip, anxious to engage, but she needed an overview of the situation first. Locating the squad map, she scanned the terrain and the positions of each soldier. There were five personnel besides Shelley: a sergeant, two specialists, and two privates. The map also showed the enemy’s positions and their weaponry—field intelligence automatically compiled from helmet cams and the squad’s surveillance drone. The map showed that Shelley’s squad was outnumbered and outgunned. With little shelter in a flat rural landscape of dusty red-dirt pastures and drought-stricken tree farms, they protected themselves by continuously shifting position in a fight to hold a defensive line north of the village that was surely the target of this raid. The insurgents’ ATVs had already been eliminated, but two pickup trucks remained, one rigged with a heavy machine gun and the other with a rocket-launcher pod, probably stripped off a downed helicopter. The rockets it used would have a range to four kilometers. Shelley needed to take the rocket-launcher out before it targeted the village and before his squad burned through their inventory of grenades. Karin switched to Holder. His ambush would go off in seconds. She did a quick scan of the terrain around him, located no additional threats, and then switched focus to Valdez. Cities were the worst. Too many places for snipers to hide. Too many alleys to booby trap. Karin requested an extra surveillance drone to watch the surrounding buildings as Valdez trotted with her squad through the dark streets. She’d feel more secure if she could study the feed from the seekers, but there was no time—because it was her new client who faced the most immediate hazard. Lieutenant Shelley was on the move, weaving between enemy positions, letting two of his soldiers draw the enemy’s attention while he closed on the rocket launcher. The truck that carried the weapon was being backed into the ruins of a still-smoldering, blown-out farmhouse. The roof of the house was gone along with the southern wall, but three stout brick walls remained, thick enough to shelter the rocket crew from enemy fire. Once they had the truck in place, it would be only a minute or two before the bombardment started. Not a great time to switch handlers. He scuttled, hunched over to lower his profile, crossing bare ground between leafless thickets. Shooting was almost constant, from one side or another, but so far he’d gone unnoticed and none of it was directed at him. A wide swath of open ground that probably served as a pasture in the rainy season lay between Shelley and the shattered farmhouse. He needed to advance a hundred meters across it to be within the effective range of his grenade launcher. There were no defenders in that no-man’s-land, but there were at least eight insurgents sheltering within the remains of the farmhouse—and the second truck, the one with the machine gun, was just out of sight on the other side of the ruins. Karin shook her head. Shelley couldn’t see it; it was a gesture meant only for herself. There weren’t enough soldiers in his squad to keep him out of trouble once the enemy knew where he was. Would it be tonight then? she wondered. Would this be the night she lost someone? It was the expected answer, but she’d had to try. The shooting subsided. In the respite, audio pickups caught and enhanced the sound of a tense argument taking place at the distant farmhouse. Then a revving engine overrode the voices. A check of his setup confirmed he had the feed from the surveillance drone posted on the periphery of his visor display. Her voice was calm, so Karin said, “Stand by,” and swiped her window-set aside. He accepted her judgment and slammed to the ground, taking the impact on the arm struts of his exoskeleton as the racing pickup braked in a cloud of dust. Shelley didn’t turn to look. The feed from his helmet cams remained fixed on the truck parked between the ruined walls as he set up his shot. The battle AI calculated the angle, and when his weapon was properly aligned, the AI pulled the trigger. A grenade launched on a low trajectory, transiting the open ground and disappearing under the truck, where it exploded with a deep whump!, enfolding the vehicle in a fireball that initiated a thunderous roar of secondary explosions as the rocket propellant ignited. The farmhouse became an incandescent inferno. Nightvision switched off on all devices as white light washed across the open ground. Karin shifted screens. The feed from the surveillance drone showed a figure still moving in the bed of the surviving truck. An enemy soldier—wounded maybe, but still determined—clawing his way up to the mounted machine gun. “Target to the northwest,” she said. The audio in Shelley’s helmet enhanced her voice so that he heard her even over the roar of burning munitions. He rolled and fired. The figure in the truck went over backward, hitting the dusty ground with an ugly bounce. Karin watched until he put a hundred meters behind him; then she switched to Holder, confirmed his ambush had gone off as planned; switched to Deng who was driving an ATV, racing to cut off her own insurgent incursion; switched to Valdez, who had finally joined up with another squad to quell a street battle in an ancient desert city. “Delphi, you there?” Shelley asked. “I’m here.” Her voice hoarse, worn by use. Dawn had come. All along the northern border the surviving enemy were in retreat, stopping their exodus only when hunting gunships passed nearby. Then they would huddle out of sight beneath camouflage blankets until the threat moved on. The incursion had gained no territory, but the insurgents had won all the same by instilling fear among the villages and the towns. Karin had already seen Valdez and Holder and Deng back to their shelters. Now Shelley’s squad was finally returning to their little fort. “Is Hawkeye done?” he asked her. Karin didn’t answer. It wasn’t appropriate to discuss another handler. Exhaustion clawed at her and she wanted to tell him no. No, I will not be back. There wasn’t enough money in the world to make this a good way to spend her life. Then she wondered: When had it ceased to be about the money? The war was five thousand miles away, but it was inside her head too; it was inside her dreams and her nightmares. In her worst nightmares, she lost voice contact. That’s when she could see the enemy waiting in ambush, when she knew his position, his weaponry, his range . . . when she knew her clients were in trouble, but she couldn’t warn them. It wasn’t money that kept Karin at her control station. As the nightmare of the war played on before her eyes, it was knowing that the advice and the warnings that she spoke could save her soldiers’ lives. Linda Nagata grew up in a rented beach house on the north shore of Oahu. She graduated from the University of Hawaii with a degree in zoology and worked for a time at Haleakala National Park on the island of Maui. She has been a writer, a mom, and a programmer of database-driven websites. 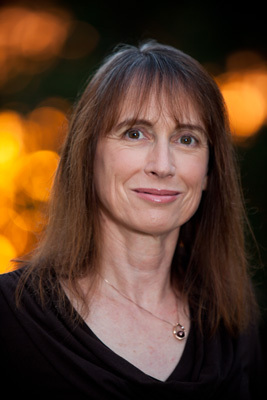 A Nebula and Locus-award-winning author, her more recent work includes short fiction “Nahiku West,” runner up for the 2013 Theodore Sturgeon Memorial Award, and the novel The Red: First Light, a near-future military thriller that was a finalist for both the Nebula Award and the John W. Campbell Memorial Award. She lives with her husband in their long-time Maui home.